Other Products: Sizzix Tim Holtz Woodgrain Embossing Folder, red and green cardstock, brads, green rhinestones and pearls. Instructions: Click here to view a larger photo of this project. Die cut 6 pieces of white cardstock using Gift Of Love Box Die. Cut off the top 2 sections of the die cuts and the tabs on the 3rd section. Adhere all the tabs on the resulting middle piece to the next piece to create the gift basket. Trace around the base of the basket on 2 pieces of white cardstock and cut them out. Adhere one to the outside of the base and one on inside of the base for a clean look and more sturdiness. Ink all the edges using Coffee Archival Ink and Stack and Store Daubers. Die cut 12 mats for the basket panels (2 for each panel) using the same die set and white cardstock. Emboss them using Sizzix Tim Holtz Woodgrain Embossing Folder. Ink them using Coffee Archival Ink and Stack and Store Daubers. Adhere them to the basket. Die cut a 10" x 2" piece of white cardstock using Sweetheart Borders Die on both sides to make the handle of the gift basket. Die cut 5 pieces of white cardstock using Arianna Lace Die. Cut 3 of them in half and adhere them behind the top flaps of the basket as shown. Adhere 2 of them together and then on the die cut handle as shown. Attach the handle to the basket using brads. Stamp the poinsettias from Poinsettia & Holly Clusters Stamp Set on a piece of red cardstock using Jet Black Archival Ink. Stamp the leaves from the same stamp set using Library Green Archival Ink on a piece of green cardstock. 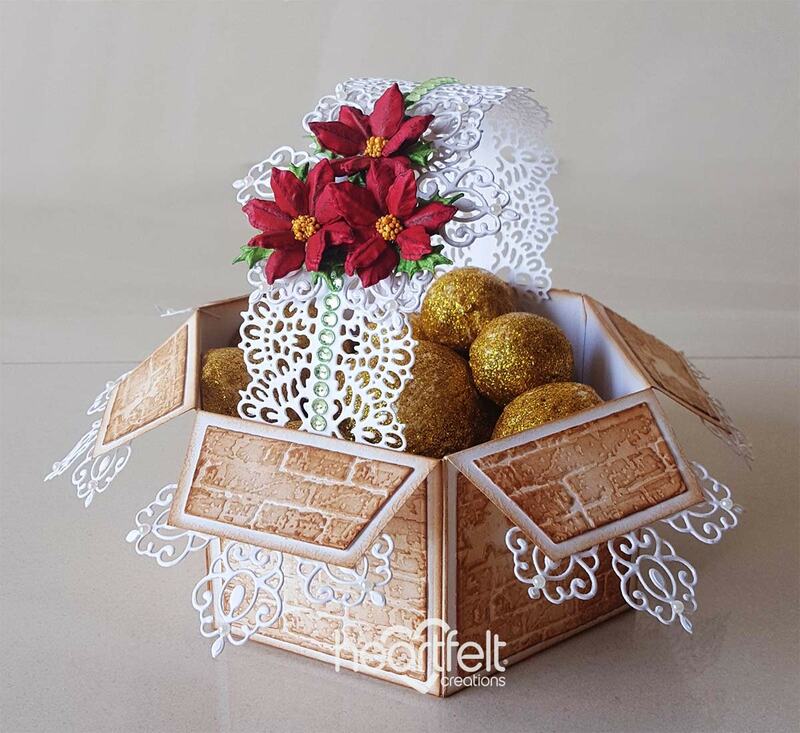 Die cut them using matching dies from Poinsettia & Holly Clusters Die. Add shading to the poinsettias and leaves using Stack and Store Daubers, Red Geranium and Library Green Archival Inks. 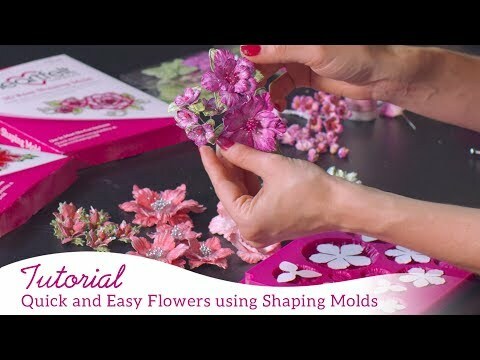 Shape them using 3D Poinsettia Shaping Mold and Deluxe Flower Shaping Kit. Add a little Go Man Go Prills from Bright Ideas set to the flower centers. Arrange and adhere the flowers and leaves on the card handle as shown. Add a strip of green rhinestones in the center of the handle and pearls on the die cuts to add the finishing touch.